Inline Flow Restrictor for 36 GPD RO w/ Quick-Connect Fittings. 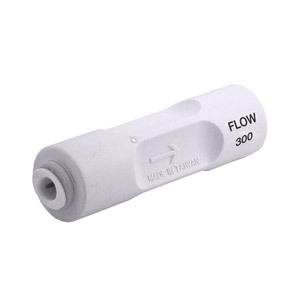 This most common type of flow restrictor connects easily anywhere on the RO drain line. If your system has a flow restrictor that looks like this one, then simply put the new one in place of the old. Some RO's use other types of flow restrictors which are all less common. These include drain fittings with built-in restrictors and capillary flow restrictors that insert into one end of the drain tube. Rainsoft RO's use drain tubing with a very small opening and the narrow opening in the tube acts as a flow restrictor. Some manifold type RO's have built in flow restrictors. All these alternative types of flow restrictors would not be visible without removing the drain tube or fitting from the membrane housing. However if your drain flow restrictor does not resemble the one shown on this page, then you must have another type of restrictor. In this case it is important to find and remove the original flow restrictor because if this is not done then it will serve no purpose to add the new one. If you have any questions about changing the membrane and flow restrictor in your RO system call one our Certified Water Specialists for the answers you need. We will be glad to help you.